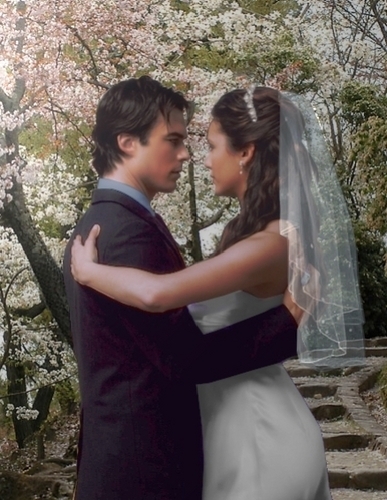 Elena and Damon's wedding. . Wallpaper and background images in the The Vampire Diaries TV toon club tagged: the vampire diaries elena and damon. This The Vampire Diaries TV toon fan art contains bruidsmeisje. There might also be boeket, corsage, ruikertje, bouquet, and posy. I want it to be real right now, Damon elena rocks, stephan i hate u!!. I hope this never happens! Damon is too good to end up with Stefan's sloppy seconds. That is way too hillbilly for me...no way! That's a page right out of The Maury show--hell no! well sasha317, i totally disagree, i think they would make a great couple. in fact, i hope Delena happens soon. that's how much i love them together. they look so great together and i'm torn cuz i love her w/stefan too. I would LOVE for this to happen...but, I don't like her dress or her tiara!!! they look like there about to kiss,so cute hope it happens! Hope it happens in season 4! season 4 will be the delena season, elena told damon that she wanted top let stefan go, so.........my guesee delena will become! They are perfect together! Damon has to stay with Elena! sera que elescasaram,na vidaa real? Damon and Bonnie are you kidding ... really ??? NO WAY !! Elena belongs with Damon she just doesn't know it yet , Damon is so so so HOTTTTT !!! I hope it will happen. Damon forever! ELENA HAS NO IDEA HOW LUCKY SHE IS!!!! This is photoshopped but cute. i love it. they are so cute. they belong to each other. i TOTALLY love this picture. delena rocks than stelena N.O to for the fans of stelena!